When you move into your college dorm room, your first goal is to make it feel like home. You want a relaxing environment that you look forward to coming back to after a long day of college classes, and you want an environment that is inviting for friends and family to come visit you in. While your Twin XL Comforter is the centerpiece of your dorm room decor, you don't want to forget about your dorm floor. You'll want to add some extra comfort and dorm room decoration to that linoleum floor, and a great place to begin is with our Rhapsody Dorm Rug in Black and Ivory. 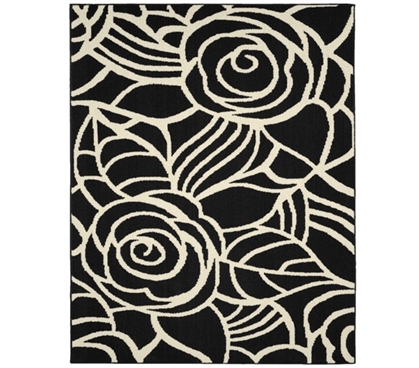 Our Rhapsody Dorm Rug in Black and Ivory has a stunning design that is quite eye-catching. Not only is it eye-catching, but it is also quite easy to mix and match with your other dorm room decorations. 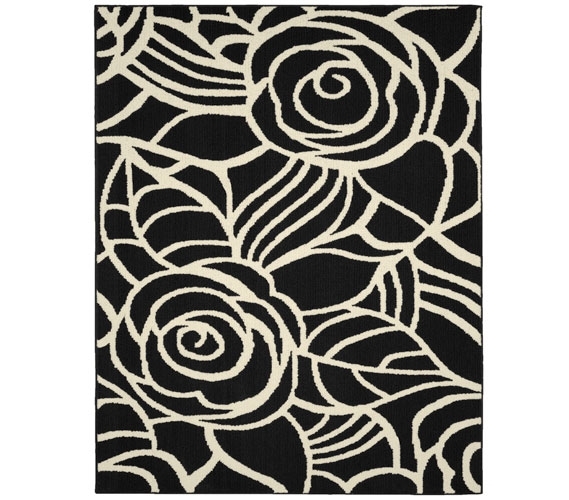 This dorm essentials item features large sketched flowers in ivory on a black backdrop for a color combination that is neutrally colored and creates quite an impact. Even though your dorm rug may not cover your entire floor with dorm carpeting like you are used to at your home, it will go a long way in completing your dorm room decor. Plus, in two sizes, you can choose to cover the area around your dorm desk, TV, or dresser, or you can place it between your bed and another large dorm item for a complete look.